Rob Roy was released one month before Braveheart, and was nominated for 1 Oscar (Tim Roth, Best Supporting), while its competitor was nominated for 10. Both are based in the Scottish Highlands, both focus on strong, long-haired, hero characters, who both have affronted wives, both fight the Englishmen, both value honor; I could go on and on. This happens sometimes, two movies come out in the same season, are essentially the same film, and audiences are forced to pick there favorite, I guess. In this case, there’s no one on the planet who would pick Rob Roy over William Wallace, but that doesn’t mean that the former has nothing to offer. Rob Roy is a very good war drama with some excellent and exciting aspects; the fact that it’s not as perfect as Braveheart shouldn’t be held against it. Scotland in the 1700s is a land where tradition battles change, and mere men don’t dare stand in the way. The English nobility rule the land and the Scotsmen work it, tending it for their liege lords but mostly going about their own business. One such clan leader, Robert Roy McGregor, the head of a respected family in the Highlands, might herd cattle for the British, but he also has plans of his own. He borrows 1000 pounds from his lord Montrose, in order to buy his own cattle, but the money is stolen, and now Rob owes a debt he cannot pay. But the money was taken in a plot involving Montrose’ own nephew, the evil and foppish Archibald Cunningham, who Rob will have to confront. His honor is being affronted, his family is being threatened, and any man who thinks a McGregor will back down from a fight is sorely mistaken. 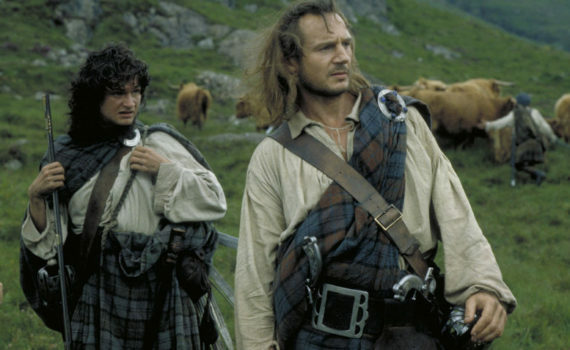 I know that some people don’t like Braveheart, but they’re ridiculous; it’s one of the best “movies” ever made, especially if you separate it from “films”. You know what I mean, there’s a different between the two, and Braveheart is an epic war story like very few others. Rob Roy can’t compete with that, and it has to, because it’s so similar and was released at the same time, but that doesn’t mean it’s worthless. It’s still a very exciting and interesting drama, filled with fights and insults and plans and escapes, a classic David vs Goliath struggle that we don’t quickly tire of. Liam Neeson is an awesome Scottish badass, John Hurt is a wonderfully hateable villain, and Brian Cox plays a simpering sycophant that is so not his usual style and so great. But Tim Roth really does steal the show, he’s other-worldly as the detestable Archie, a role for which he definitely deserved his nomination. You don’t have to pick; you can like both of these movies, they both have strong qualities, and Rob Roy is fine historical fiction if you give it the chance.